Holidays are big around here and with Spring comes Easter and with Easter comes Easter Eggs. 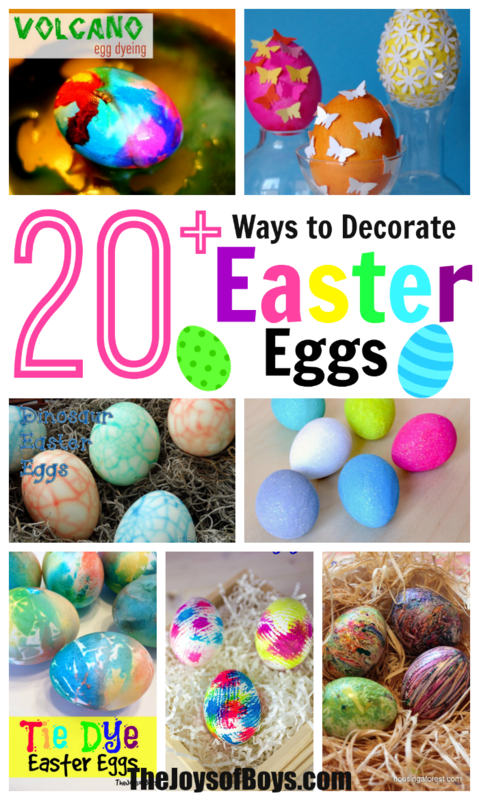 Today I am sharing 20+ Fun Ways to Decorate Easter Eggs. 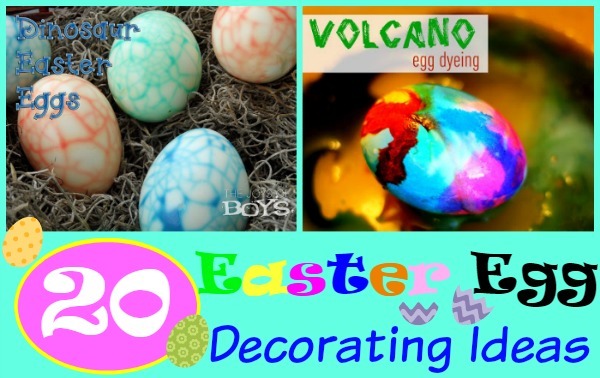 My boys love decorating Easter Eggs each year and we love looking for new fun ways to decorate Easter eggs. I have searched high and low and have found some really fun and unique ideas that I can’t wait to try out this year. 1. 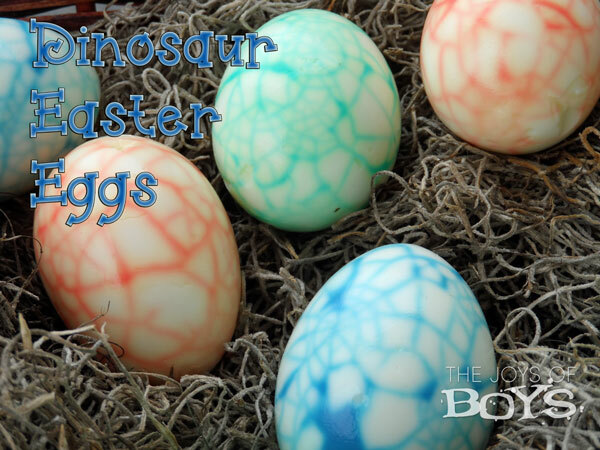 Dinosaur Easter Eggs – These are our personal favorite way to decorate Easter eggs! 2. Rainbow Colored Easter Eggs These would make great deviled eggs. 3. Silk Tie Easter Eggs -These are so pretty! I had no idea you could decorate eggs like this. 4. Glitter Easter Eggs I love all things that glitter! So fun! 5. Tie-Dye Easter Eggs If your kids have a little patience, these Easter eggs are so fun to make! 6. 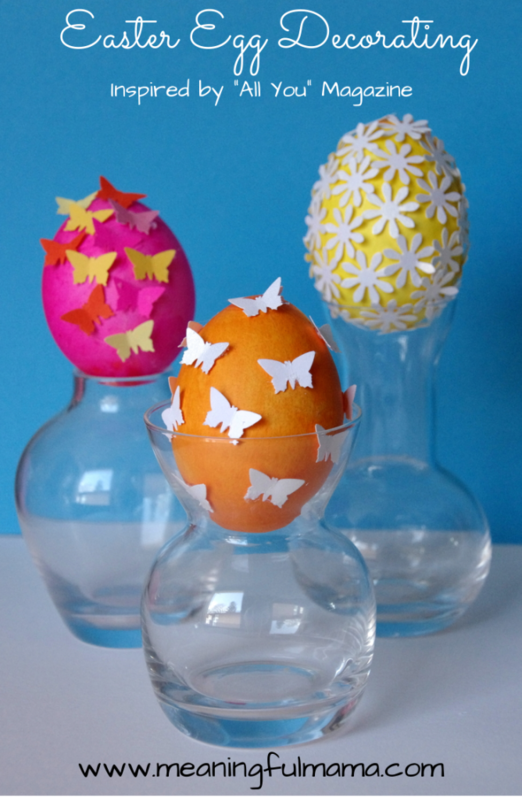 Rubber Band Easter Eggs – This is such a simple idea and the results are so cool! 7. Foil Eggs These are so unique. You could decorate them in so many ways. 8. Humpty Dumpty Family – Haha! These are so funny! 9. Vibrant Color Eggs -Ooh!! So bright! 10. 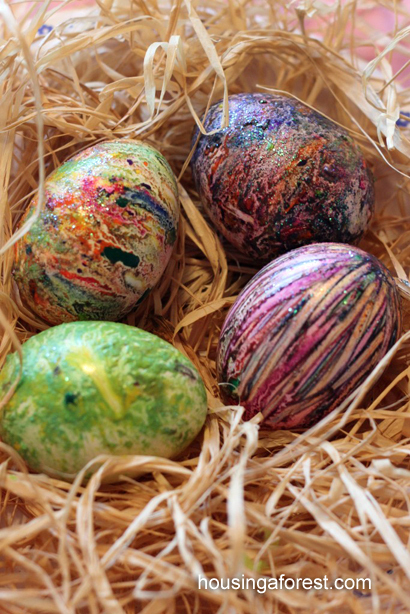 Melted Crayon Easter Eggs These are SO cool! 11. Speckled Easter Eggs This is a simple way to create speckled Easter eggs. 12. Glitter Egg Diorama This is a fun thing to do with leftover egg shells. 13. Monogrammed Easter Eggs These are fun for moms! 14. Chalkboard Easter Eggs So these aren’t exactly “eggs” but still a fun way of creating some fun this Easter. 15. Magazine-Inspired Eggs These are so fancy! I love the flowers. 16. 3-D Panoramic Eggs These 3-D Easter eggs are so cute and perfect for older kids who want a challenge. 17. Tie-Dye Easter Eggs This is another fun way to tie-dye Easter eggs. 19-Baking Soda Easter Eggs Mixing science and Easter. So fun!! 20. 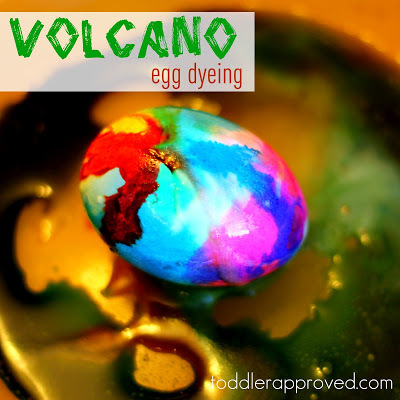 Volcano Egg Dyeing My boys are definitely wanting to try these volcano Easter eggs. 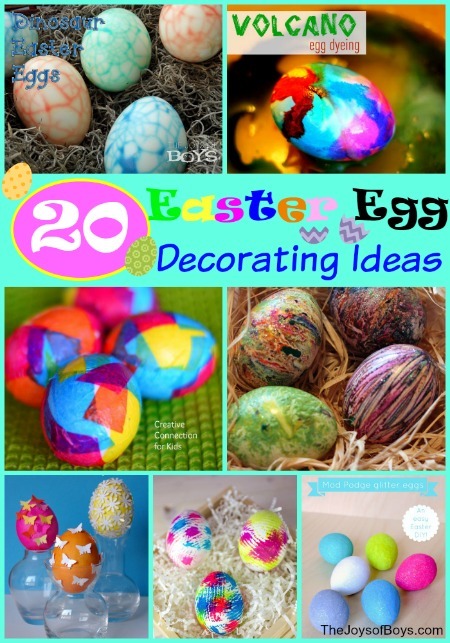 My boys are asking if we can try each of these ways to decorate Easter Eggs. Luckily they are getting old enough to start decorating eggs on their own. I still supervise, but for the most part they can decorate their eggs on their own. I can’t decide which Easter eggs are my favorite! They are all so creative! These are all great ways! My favorite is the volcano ones they are awesome! Thanks for sharing all these great ideas! All very cool! I especially like the glitter eggs! Thanks for sharing all these great ideas. I’ll definitely be trying out some volcano eggs! What fun dyeing ideas. We’ll be dyeing our eggs tomorrow so I’m excited to try some of these techniques out. Thanks for including my Humpty Dumpty Family.